The planned route from our marina on the Neuse River to Cape Lookout. The long skinny water way we traversed in the center of the picture is called Adams Creek on the north end and Core Creek on the south end. We departed Hancock Marina on the Neuse River Sunday afternoon and sailed east on a light south west breeze 13nm to a place we like to anchor in the ICW near the mouth of Adams Creek. We’ve always enjoyed this spot. It’s well protected but wide enough that the breeze is not cut off by the trees or terrain. Next day, we motored south in the narrow waterway against a southerly breeze to the deep-water port of Morehead City, NC. There, we temporarily anchored outside the shipping channel near Ft Macon and waited for the tide to change. While not a huge port, it almost always has large ships loading or off-loading cargo or containers. The currents are swift and the channel is narrow. Our plan was to wait for low slack water at the beginning of the flood tide around noon. Even though the tide would be turning foul (flowing against us) at least it would be aligned with the wind and keep the channel reasonably tame. Sailing down the Neuse on Day 1. As soon as I am back on the water, the pressures of everyday life seem to slip away. Motoring Down Adams Creek towards Beaufort, NC. Most people who have a home on the water want a boat in the backyard. Not this fellow—he has has a Roberts helicopter…. But, there were impending thunderstorms developing so we decided to get underway with about 45 min left before slack water. With a single reefed main and working jib we beat out of the inlet into an 18-20 kt SW breeze. The swells were large due to the ebb current and it was a little more “hairy” than I like. We could not make the dogleg to the southwest without tacking back across the channel and I did not relish such a maneuver in the big waves. We checked the chart and it looked like we had room to angle out of the channel and still have enough depth over the west side of the shoals on the east side of the shipping channel. The course change of just 15-20° allowed us to foot off and we sailed along the west side of Shacklefort Banks towards Cape Lookout. We made it into the Bight and anchored about 1330 in 20’ of water near the west side under the dunes. In no time we got hammered by a crackling electrical storm and pouring rain. Our 45 lb Spade anchor and about 110’ of 5/16 HT chain held us secure. Dirty weather rolling in from the NW. The Bight is the same place we took our departure from for our passage to the BVI two and a half years ago and where we made landfall on return. It is a gorgeous near 360° protected cove about 1.25 nm across protected by low sand dunes and offering a safe haven from the wild Atlantic and Core Sound. It is of course under the dominate and watchful eye of the famous black and white diamond patterned Cape Lookout Lighthouse. We had plenty of rain. But it was never a problem. We were quite comfortable inside the cozy interior of the Far Reach. After three years of sailing the FR, I would not change a thing about the interior layout or any of the many modifications we made over the course of the six year rebuild. As it was Monday there were only about a half dozen boats anchored in the Bight. One of the most noticeable was an FPB fast trawler which was anchored near us. It is a very neat looking bare aluminum ship that looks more like a naval patrol craft than private cruising trawler. Anyway, I had seen this particular FPB before, on the hard at Jarrett Bay, a boat yard not far away. I am familiar with the FPB design. It is designed by Steve Dashew who I have read about off and on over the years. The Dashews are well known long range cruisers and sailing circumnavigators. They are highly experienced. They are not, however, “keep it simple” kind of sailors. They espouse speed and technology as a key component of safety at sea. Steve designed the Sundeer line of fast cruising sailboats and campaigned their famous 78’ ketch Beowulf before breaking into the design of the highly advanced FPB expedition power trawlers. The FPB is fantastically expensive but robust and incredibly capable if you have a couple million to burn and a healthy budget to maintain such a ship. And while I am much more philosophically aligned with Slocum, Moitessier, the Pardeys, Roth’s, and Hiscocks, I always take the time to read his stuff because it’s just interesting. And damn it, I can’t help it, I just really like the FPB. If money were no object…. Cochise, a Dashew 78’ FPB. Anyway, the owners of the Cochise came by around sunset. They came along side in their yellow center console RHIB. They were an older couple. Dressed more like offshore sailors that just finished working on their boat. Very nice people. Very unassuming. Said they admired the Far Reach as “it looks like a proper sailboat.” The next words the gentleman spoke were “you don’t often see a sailboat without a furler anymore.” I took their bow line and secured it and in the fading light we chatted while Gayle and I sat on deck and they in their RHIB for about 30 minutes. They asked a lot of questions about the FR. He was interested in our rotating arm outboard engine bracket. We asked about their boat Cochise. Finally, we introduced ourself and darn if it wasn’t Steve and Linda Dashew themselves! We wrapped up our conversation with them as darkness fell and off they went back to their boat. We were both impressed by how down to earth they were. You would never have know they are hugely successful entrepreneurs, consultants, boat builders, naval architects and writers. And even though they have a philosophy built around technical solutions they could not have been more complimentary of the simple yet elegant Far Reach. You meet the most interesting people on the water. Here is a link to the Dashew’s website if you are interested in knowing more about the impressive FPB. About 0230 Tuesday morning we were awakened by a wild windstorm and more rain. With a 180 degree NE wind shift, we were suddenly on a lee-shore. There was not a lot we could do unless we slipped the cable and sailed out or perhaps deployed a second anchor. We were not dragging with our 45lb Spade. Because Carl Alberg designed the Cape Dory 36 with a low freeboard and because we don’t have a lot of stuff hanging off the boat like dodgers, furlers, or arches we have relatively low windage. So we sat tight and watched the trawlers power up and re-anchor on the opposite side of the Bight. It was an anxious time as all cruisers know far too well. When the sun came up Cochise was gone. We lounged about and finally got the dinghy in the water, rowed ashore, and went for a long walk on the Atlantic side of the dunes. It was nice to see the Far Reach at anchor. She looked a little disheveled without her sail cover and flying our laundry. But we wanted to be ready to go with the ugly wx still threatening us. We spent the day just lollygagging and enjoying being on the water. The Far Reach anchored on the west side of the Bight after a wild night of wind and rain. The famous lighthouse is just to the left of the stern of the FR. At 0430 Wednesday we had another intense rain squall. There were tremendous wind shifts and pouring rain but it was over in 45 min. Sunrise was gorgeous. What a delight it is to share morning coffee on your boat with your life long companion…especially a boat you love being on. Later, we decided to sail our dinghy across the Bight the 1.25 miles to the Cape Lookout Lighthouse National Park. Sweet Pea is our 9’ Fatty Knees we have had for 14 years. She is a great tender. She rows and sails equally well. It was a broad run with a couple gybes thrown in to keep us from running dead down wind in the strong breeze. Our chariot awaits us. Sweet Pea rigged for sailing. The dinghy step-up, hooked over the bulwark, which I described building in an earlier post, worked perfectly. We had never visited the lighthouse. It is, simply put, fantastic. 160’ high and built from 1857-1859. The lighthouse, and grounds that extend all the way down to the point of Cape Lookout itself, are part of the Cape Lookout National Park. We paid $8 each for two tickets and made the climb to the top of the distinctive diamond patterned lighthouse via the 176 steps of the spiral staircase. The closer you get to the light house the more evident its quality as an object of art and not just as an important navigational aid to mariners. I took this photo with my back to the Bight. The light keepers home is beautifully restored and open to the public. The lighthouse was built from 1857-1859. Except for two years during the Civil War, when the light was extinguished, it has been in operation ever since. The diamond pattern is unique to this light house which allows it to be distinguished from others along the east coast as an aid to daytime costal navigation. The views were stunning! We took pictures and marveled at the beauty of coastal North Carolina. The rangers and volunteers guides were knowledgeable and very friendly. Looking NW from the lighthouse. The low lying green island is Shackleford Banks. It runs all the way back to the Beaufort Inlet about 7.5 NM away. It is home to a famous wild pony herd. The Bight is to the left in the photo. We sailed in and out of the inlet at the top left center in the photo. Barden Inlet is the deep water at the bottom of the photo which connects the Bight to Core Sound. Looking west across the Bight. The Far Reach—too far away and too small to be seen— is anchored just this side of the low lying dunes at the top of the photo. The Atlantic is on the far side of the dunes. Looking SE. The photo depicts the east side of the Bight with Cape Lookout stretching out towards the left in the photo. The Atlantic is to the top left. Looking SE down the length of Cape Lookout which curves to the left. The Atlantic is to the left and at the very top. You can just see the edge of the Bight to the right. Looking NE along South Core Banks (the name of the barrier island we are on and one of a series of barrier islands that makes up the Outer Banks. Core Sound is on the left and the Atlantic is on the right. Cape Hatteras is about 65 miles NE. When it was time to leave we walked back down to the beach and shoved off on Sweet Pea. We had a wet beat back to the Far Reach where we showered and rinsed our cloths and had a great dinner. The stars came out in all their glory. I could be a water rat for the rest of my days. There was no sleeping-in Thursday morning. Reveille was sounded at 0500. We planned to weigh anchor at 0600 in order to catch the last of the flood tide into Beaufort Inlet. But, we got a late start. 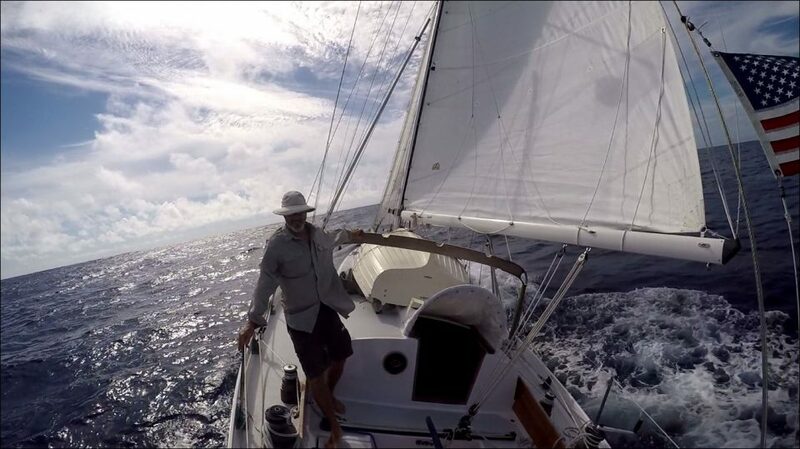 At 0645, we sailed out of the Bight with a single reefed main and a working jib. I cleared the stays’l from the foredeck earlier as I anticipated we would have some tacking to do in the rising west breeze. As expected we could not lay the necessary mark to make it around the shoals on the east side of the shipping channel so we tacked to southwest in about 18 kts of wind and a three to four foot chop. Finally, we were able to tack back to the north and lay the inlet. We saw a couple of sea turtles on the way and a number of dolphins. As we worked through the dogleg and cleared the shoals we were making about 7.5 knots on a near slack tide. We sailed through the inlet on a reach and worked our way up to marker 23, just past Ft Macon and the Coast Guard Station. There, we dropped sails and used the little outboard to motor over to Beaufort, via Taylor Creek. We anchored off the waterfront in 10’ of murky water on a mud bottom scoured by a fast current. It’s a crowded anchorage so you have to wedge yourself into the edge of the mooring field and the anchored boats adjacent to the long narrow channel. Then we sat through several hours of pouring rain and a biblical electrical storm. Gayle crushed me in several hands of Gin Rummy. A real gully-washer. As a bonus, it came with an intense electrical storm. After the storm cleared we easily launched the Sweet Pea and rowed ashore. We had burgers for supper and took a walk through the historic town. Beaufort is sort of local to us so we have been there many times. The world famous Big Rock deep sea fishing tournament was taking place so the docks were chockablock with high end multi million dollar sport fishing boats. These boats have huge multiple turbo diesels and giant fuels tank to carry them rapidly out to the Gulf Stream regardless the weather. The boats were gleaming with varnished teak and waxed topsides. Most all the boats had tuna towers and multi spreader out-riggers. Every boat displaced racks of insanely expensive fishing rods and powerful reels to haul in 1000 lb billfish. I don’t know what first prize is this year but in the past it was $1,000,000. That’s right… a one followed by six zeros. Just a small part of the Big Rock Tournament sport fishing fleet. These boats are high end. They are big, powerful, and fast. The west wall of the Gulf Stream is about 40 miles offshore. These boats are designed and built to get there quick and safely handle the changing conditions associated with deep-sea fishing. The sunset row back to the boat was fabulous. The air was soft and cooled by a perfect 10 kt breeze. The current carried us silently down Taylor Creek to the Far Reach. While drifting along we marveled at the historic wild pony herd on Carrot Island (200 yards south) while looking back to the north side of Taylor Creek at the incredibly expensive fleet of ultra exotic sport fishing boats. Friday morning broke with more rain and thunder. We delayed departure a couple hours finally getting underway about 0930. The little Honda carried us 16 nm up the ICW against a NE breeze. We anchored near marker 10 on Adams Creek…the same place we spent the first night on our trip. We enjoyed the quiet solitude. We read, ate, played cards, and watched the ospreys and other sea birds. In the early evening we placed our lazy-chairs on the side deck in the shade and spent a long while listening to a couple parties taking place on shore. It sounded like they were having a lot of fun. Sunset near the north end of Adams Creek. Another day in paradise coming to an end. The Far Reach is a magic carpet. No words are necessary . . . .
On Saturday, we made the final run towards Cherry Point. We had a light easterly but managed to sail down-wind, wing-and-wing, about 10nm up the Neuse River to our marina. The Cape Horn windvane handled the light air down-wind run pretty well. We had our full main, working jib, and stays’l up and drawing. We also got all the sails and canvas dry from the week of showers. Running down wind wing-in-wing—main, stays’l, working jib. The Cape Horn self steering windvane performed well even in these light air down wind conditions. The cruise is almost over. In the background—the Cherry Branch Ferry is crossing our wake. Gayle was, as usual, a great companion and crew. It was a wonderful relaxing 7 day early summer cruise. Hopefully we will have a few more this summer though by July it is blazing hot in coastal NC. That’s usually the time we head to the much cooler temps of the Smoky Mountains for camping and hiking. Sounds like a good little cruise you’ve enjoyed, thanks for sharing it with us! S/y Far Reach is looking fantastic as always!